Service Costs > How Much Does Deadbolt Lock Installation Cost? How Much Does Deadbolt Lock Installation Cost? A deadbolt will provide more security for both homeowners and business owners, adding that extra layer of security your door will need. While most new doors come with a deadbolt, there are older doors that may not be equipped with one. Whether a fresh install needs to be made or a previous install needs to be updated, the cost of deadbolt installation is going to depend on the geographical location, the complexity of the job, the number of doors and contractor performing the job. How much does a deadbolt lock installation cost? On average, a locksmith is going to charge a service charge minimum no matter what job is performed. A service charge is going to vary anywhere from $35 to as much as $65, depending on the company. This will be paid, regardless of what’s being done. If a deadbolt has already been installed in the past and a new one needs to be installed, a locksmith will generally charge anywhere from $15 to $45 to replace it with a new one. This won’t include the deadbolt itself. If a new deadbolt hole has to be installed, the fees can range from $55 to $125. This job will generally take a handyman or locksmith up to 30 to 60 minutes to complete the job. 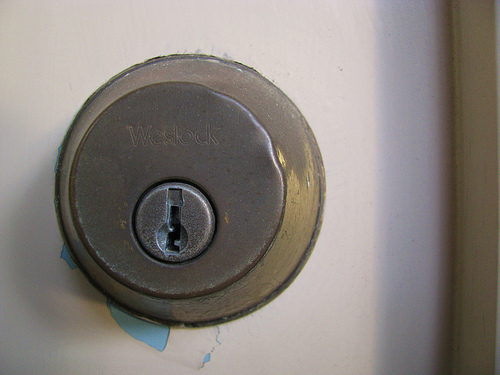 If a deadbolt has to be re-keyed and not replaced, the cost can be anywhere from $10 to $25 per door. Overall, plan on spending anywhere from $75 to $215 for the complete installation process of a deadbolt. Angie’s List interviewed a locksmith and he stated he would charge $55 for the trip, $35 for a basic deadbolt and another $45 to install on a wood door or $50 for a metal door, bringing the average job to $135 to $145. A locksmith will be able to recommend deadbolts that meet your budget. A deadbolt will be installed by either installing a new hole or by replacing the old deadbolt with a new one. A deadbolt can either be purchased through a locksmith or on your own at a home improvement store or online. Deadbolts can range anywhere from $25 to as much as $300 or more for a high-tech version. For example, the Defiant keyless deadbolt retails for about $60+. If the entire door has to be cut to size, additional fees may apply depending on the number of doors as well as the complexity of the job. Consider installing the deadbolt yourself. If a deadbolt was already there, it is a very easy process that can be done. By bypassing the locksmith, you will be able to save up to $50 to $100 or more. If you have to cut a hole for a deadbolt, there are resources online that can assist you with what needs to be done. If you are going to have more than one door deadbolt installed, be sure to let the locksmith know as they can offer discounts on a per door basis. If you want to hire a professional, consider using websites such as HomeAdvisor.com. Here, you simply state your project and a few contractors in your area will offer a ballpark estimate via your email. Some companies offer repeat customers 10 to 20 percent off.